Letting go of the reins is basically a metaphor for my life right now. Let's not discuss. Today we worked through a grid with the goal of using a following rein- something a bit more than a crest release but not quite an automatic release. The photo may not do this line quite justice. It's a one to a two stride but that two is short. I mean like it might be a one. The task was to ride a grid the way one normally would- staying in two point, no pulling, but with this rather long following release. 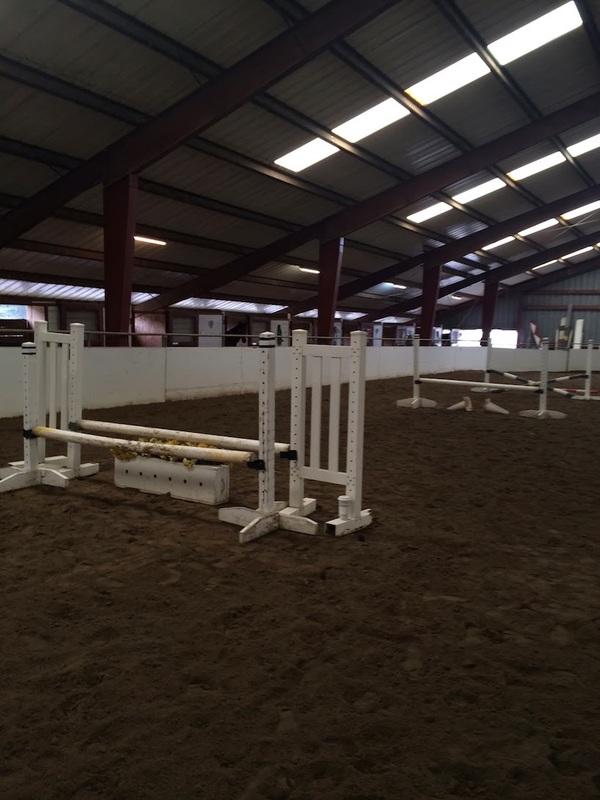 I saw my life flash a few times before my eyes in front of that oxer as Polly landed and bounded towards it. The more we went through it the stronger she got until she chipped in on that second stride and knocked a rail. That sat her back a little and we finished our last trip through with a rather shaky "Whoa" from me but a quiet two from her. My takeaway- trust Polly not to kill us both. Hopefully life stops throwing lessons about letting go at you! !